I really do need to find a more photogenic model. 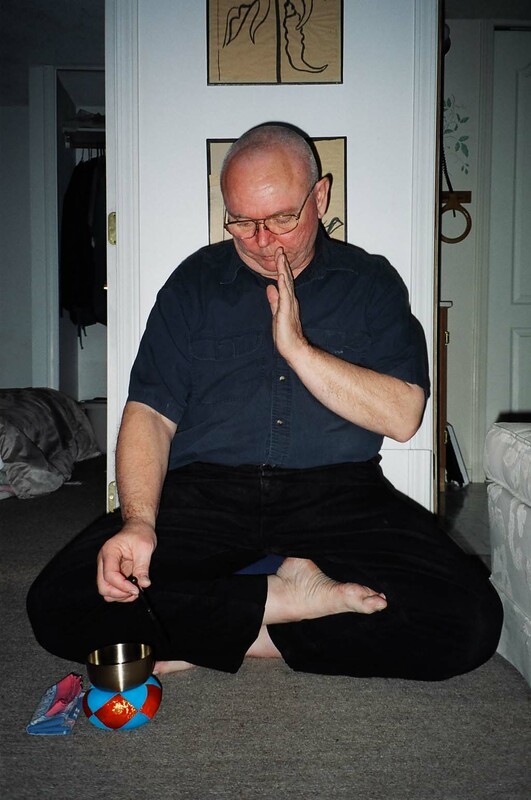 Zazen is best done in a non-stimulating environment. Lighting and outside noise and conversation should all be subdued for the duration of the meditation. As much as possible it is best to not move during seated meditation and to remain inner-directed during walking meditation. There is an initial and on-going emphasis on the body; on its posture and balance and stillness. Whether walking or seated, the body is the gateway to the inner topography which we'd like to explore a little bit, together. 4. The head, eyes, mouth and tongue. Although these are explained as four things, everything is tethered together by breath. You will notice that when you pay attention, your breath reaches everywhere. Once you have your posture arranged, follow each breath as it enters, persists, suffuses and then leaves your body. Your effort is to tether your whole effort at that moment to your breath and trust that it will take you where you need to be. For seated meditation your legs and buttocks should form a tripodal relationship. Sitting on the ground automatically creates the pelvic tilt that permits this; in a chair one has to push back into the crux of the chair in order to get this tilt. In a chair, one should lean back as little as possible. For those with some lower back pain, the act of sitting as deeply into the angle of the chair will provide some support for the lower back and make it easier to sit with an upright back, not resting against the back of the chair. What you want to end up with is a lower body posture that you can completely relax into; that does not require monitoring from you while you sit. Twenty minutes can be a long time, though, and it will take awhile for each person to find a posture that works. If you have to move, then do so quietly and slowly so as not to disturb others. If legs fall asleep, one can move enough to restore blood flow and then resume. There is no harm to simple falling asleep, but one should take care not to over stress tendons or muscles or joints. We sometimes advise people to "sit through" discomfort; but each person gets to set the limit on this. There is a spiritual benefit to sitting through some discomfort, but understand that there is no problem about alleviating discomfort whenever you wish. Just do it quietly. In the walking meditation (kinhin), stability does not come from physical posture but from mental posture. Especially in the very slow walking kinhin, there is only one mind-set that will allow one to do the meditation without losing balance. Because of this, I always think that kinhin is more difficult than the seated meditation, even though seated posture carries with it more physical discomfort. The torso: With your posture stable and your pelvis properly aligned, the upper body feels like it balances on the plane of the lower body something like a stick balances on the end of a finger. There's a feeling of stretching along a radius from the centre of the earth; of the backbone seeking the vertical alignment. Because you have established a good foundation, you can bring a good deal of attention to maintaining the vertical alignment of the spine, correcting the tendency to slouch. Try not to allow the torso to bend out of alignment, although know that you will and simply correct the posture when you realize that you have done so. When on the vertical, it takes very little energy or muscle power to hold your torso erect. 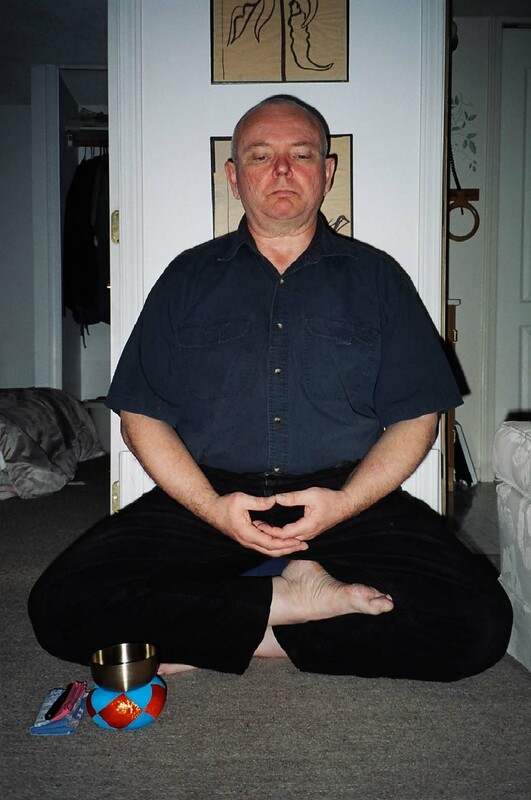 This principal works both with seated and walking meditation. The mudra: Mudra is a Sanskrit word meaning what you do with your hands. There is a different mudra for seated and walking meditation. 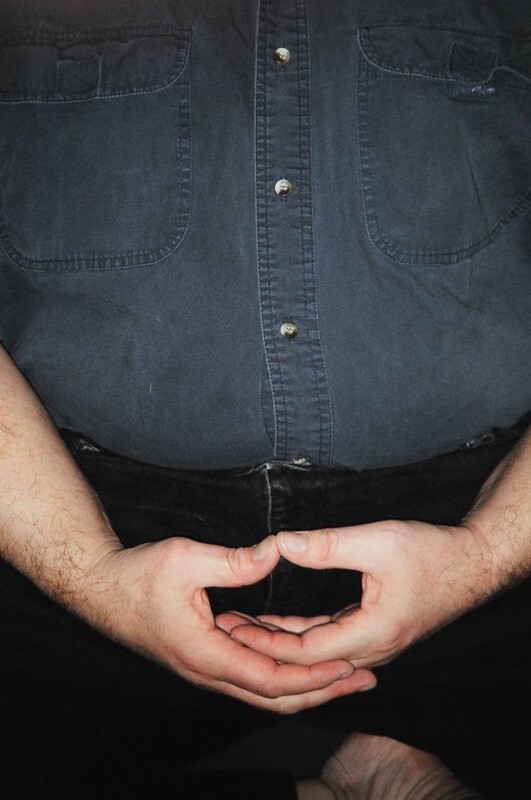 For seated meditation, the mudra is held low in the body. Your arms will rest on the tops of your thighs if you are on the ground, and more in your lap if you use a chair. The seated mudra (called cosmic mudra) is left hand palm-up resting in the right hand, also palm-up; thumbs come together in a very light contact. It is important that the tips of the thumbs touch lightly, barely discernable contact. There is thus formed an oval shape between the fingers and thumbs and the plane of that oval should be held so that it is vertical. This hand position should be position very low on the body, centered. See illustration. For kinhin the mudra is called shashu. This mudra is held at the solar plexus point. In this mudra the left hand forms a very loose fist-shape with the fingers curling around the thumb. The right hand then covers the left hand, the fingers fitting into the knuckle grooves of the left hand. When you position this arrangement at the solar plexus, hold elbows slightly away from the body and rotate the wrists so that the knuckles of the right hand are almost pointing straight up. This puts a slight torque onto the forearms. Maintaining this slight torque along with the very slight contact between right and left will require a certain amount of attention and mindfullness. When you notice that your mudra has deteriorated, then correct it. The head: The head should feel like it balances on your neck as a continuation of the vertical alignment of your backbone. The chin should be slightly tucked. rather like the military version of parade attention. Avoid a posture that involves a jutting or lifted chin. The classic texts say that your nose should line up with your belly button and your ears with your shoulders. Your eyes should remain open and cast downward in front of you at a 45 degree angle. Your mouth should be closed. lips and teeth together and your tongue should rest lightly against the roof of your mouth. Breathe in and out through your nose, taking a breath only when your body wants one and allowing the air to move in and out gently. Once you have established your posture, you can push air out, take a big, forced breath, push it out again, and from that point let it come and go without conscious direction. Mentally, the effort is to tether your consciousness to the present moment and to cultivate a radical receptivity which harbours no ill-will and no opinions for or against anything. This is the fertile ground of Zen meditation and is an artifact of mind which is confined to the period of meditation. It will serve well the needs of the real world, in which opinion and value judgements are necessary; but it is not intrinsically superior to the mindset of everyday life. Out of the stillness of meditation, the linkage between spiritual and physical well-being will become evident and there will be opportunity to bring some parity to our skill of involvement.